Why Aren’t They Sitting On The Eggs? 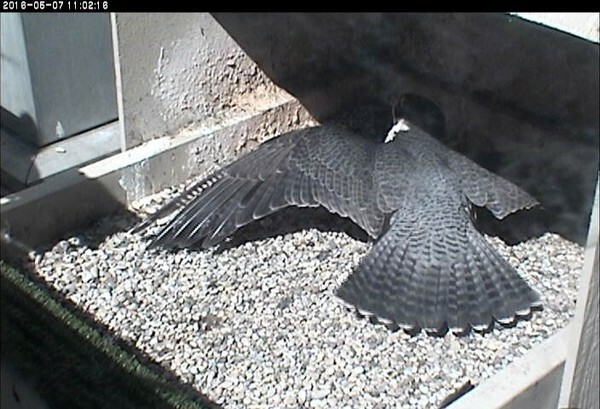 This year we have two peregrine nests on camera in Pittsburgh and both families are incubating right now. 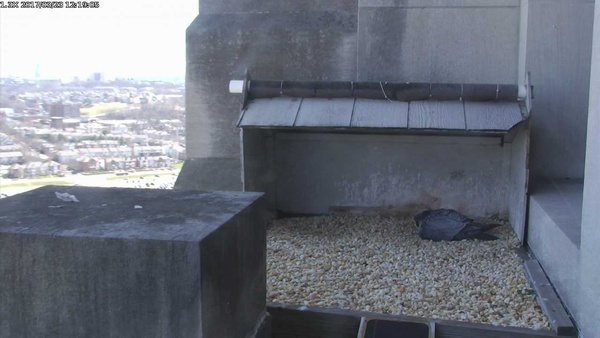 At the Gulf Tower the adults are always covering the eggs, but at the Cathedral of Learning the peregrines sometimes leave them exposed. Is this bad for the eggs? Will the eggs fail? Don’t worry. The eggs will be fine. What you’re observing is the parents’ response to different microclimates at the nests. A microclimate is a small area with a different temperature and/or moisture than the larger region. You’ve probably experienced this yourself. When it’s 50 degrees at Pittsburgh International Airport it feels cold in the shade with a 20 mph wind. Meanwhile, next to a warm wall out of the wind it can be 68oF. The Cathedral of Learning nest faces south, is in full sun most of the day, and is sheltered from the wind by walls that surround it on three sides. The walls retain heat so the area stays warm and allows the adult peregrines to take a break from incubation. The Gulf Tower nest faces northeast, has no direct sunlight, and is very windy on cold days (north winds). 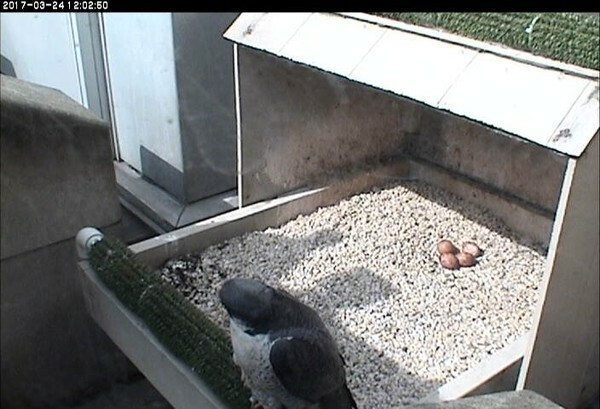 The nest is so cold in March and April that the peregrines must cover the eggs almost constantly. The heat at the Cathedral of Learning is an advantage in early spring but it’s bad news in May when the weather warms up. The area becomes so hot that the parents pant and shade their young for fear the chicks will die of heat. Below, Hope shades her chick on a hot day in early May 2016. The Gulf Tower never has this problem! So don’t worry when the Pitt peregrines take an incubation break. They know more about eggs and about the temperature at their nest than we do. p.s. Some of you were wondering if Terzo ever participates in incubation. Indeed he does! Yesterday, March 26, he spent half the day on the nest, 6.25 hours. Here’s who was incubating and when on 26 March 2017. Look carefully! Terzo is often on camera. Use these tips to identify him. I look for the “hearts” on Terzo”s cheeks..a chatter pointed that out last year when his bands were hidden. Thank you for this explanation. I had been wondering. I wondered about this when I last checked the cams ; thanks for clearing it up !